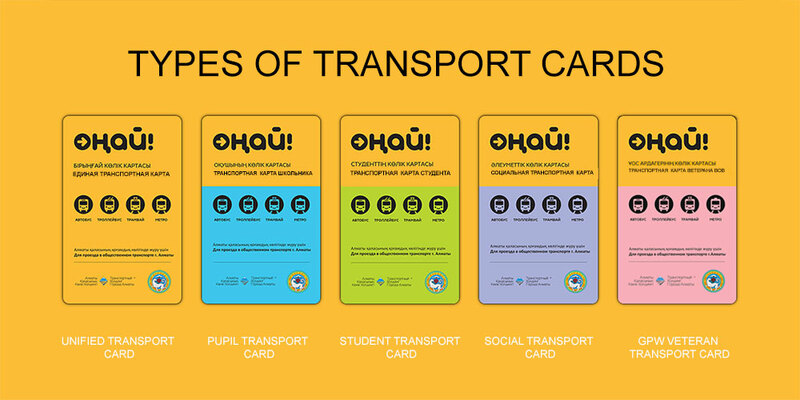 In this article we will review the card Onay: types of cards, ways to buy and fill in the unified transport card. 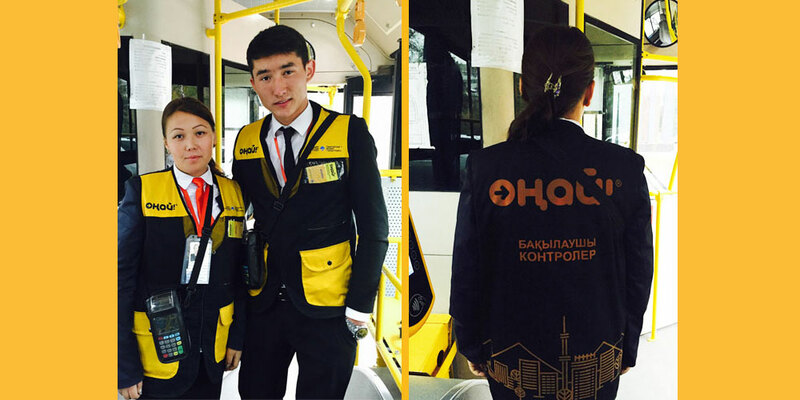 Card Onay – it is the unified card for payment in public transport in Almaty city. You can pay fare by Onay card in all kinds of city public transport, buses, trolley buses and the metro. You must have 80 KZT on the card to pay for the possibility of travel. 80 KZT is the cost of public transport in Almaty. In case of evasion penalty is 2 MCI (minimum calculation index). Apart from a unified transport cards, other cards are special, for pupils, students, socially vulnerable groups and war veterans. Cost of the unified transport card is 400 KZT. The price includes 1 trip of 80 KZT and 320 KZT security deposit (the value of the card), which is returned in case of return of the Unified transport card, in accordance with the repayment conditions laid down in the Public contract. Return of security deposit of the Unified transport card is performed at: Almaty, Ryskulbekov st., 33/1 and at special railway station cash offices marked with «ОНАЙ» sticker. For transport fare card must be attached to a special terminal. In the subway, there are special turnstiles for transport card. 1)	For fare registration in Almaty public transport, please, put your card to the bottom part of the transport terminal and hold it in place for 2-3 seconds until the green indicator lights up (✓). 2)	The green indicator and sound signal confirm the registration. 3)	Upon fare registration using «Onay» transport card, the terminal screen displays the fare amount. - card is withdrawn from service, please, go to the office at the address: 33/1, Ryskulbekov str. 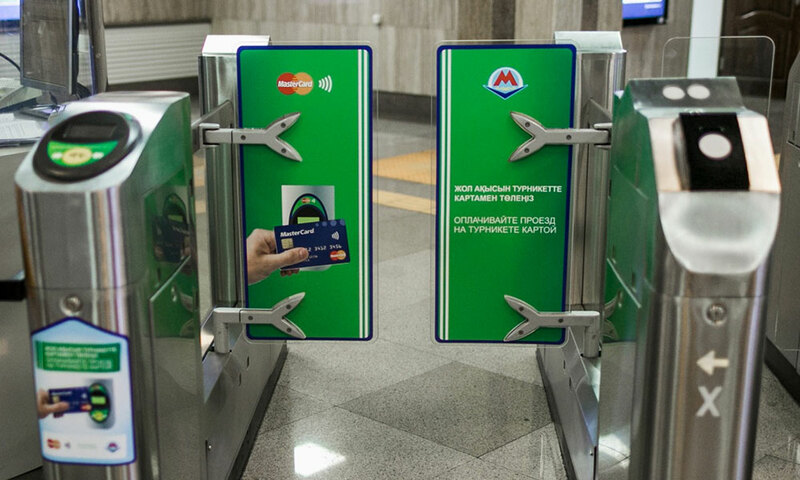 4)	To check the card balance, please, press the bottom key «Информация по карте» on the front transport terminal and put the card to the terminal. It should be noted that the card balance may be checked not earlier than 15 minutes after fare registration. If the balance is checked via the terminal earlier than 15 minutes after fare registration, the screen may display the balance without current fare registration. 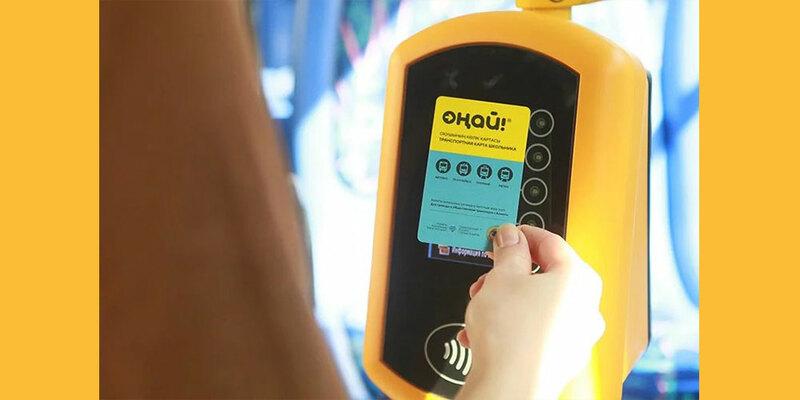 You can add money for unified transport card through «QIWI» self-service terminals, «Kassa24» (Касса24) self-service terminals («Astana Plat» LLP), «КиберПлат» (КиберПлат) self-service terminals, «Orion Pro» self-service terminals (in «Казахтелеком» JSC departments), Quickpay self-service terminals («ЭКСПРЕСС Mit» LLP), «PAYPOINT» self-service terminals («Национальный центр платежей», «MDOM.KZ» LLP), «QIWI Koshelek» (QIWI Кошелек) e-wallet, «CreditOn» e-wallet («DAR ecosystem» LLP), e-kzt e-wallet (e-kzt.kz KISC), «Kaspi Koshelek» (Kaspi Кошелек) e-wallet, «allpay» e-wallet («Allpay» LLP), «Kazkommertsbank» JSC internet banking, «Kaspi Bank» JSC internet banking, «Eurasian Bank» JSC internet banking, «ForteBank» JSC internet banking, «Bank RBK» JSC internet banking, «ATF Bank» (АТФБанк) JSC internet banking, «VTB Bank (Kazakhstan)» SB JSC internet banking, «Alfa Bank» SB JSC internet banking, «Altyn Bank» JSC («Halyk Bank of Kazakhstan» SB JSC) internet banking, «AsiaCredit Bank» JSC internet banking, «Kassa Nova Bank» JSC internet banking, «Delta Bank» JSC internet banking, «Capital Bank Kazakhstan» JSC internet banking, «Nurbank» JSC internet banking, terminals, «Bank of Astana» (Банк Астаны) JSC internet banking, terminals, «SBERBANK» SB JSC internet banking, terminals, «Halyk Bank of Kazakhstan» JSC internet banking, terminals, « Bank Center Credit» JSC internet banking, terminals and cash machines, Cash desks of «SB National Bank of Pakistan» in Kazakhstan» JSC, Beeline via SMS to number 2020, money.beeline.kz payment service, Automated cash desks of «Kazpost» (Казпочта) JSC and www.post.kz website. 6)	Enter the required amount. To refill the card through online banking you must go to the tab «payment service provider» and then to find the item with payment by cards Onay, if you can not find the desired item by yourself, it is recommended to contact the contact center of your bank. For example, payment through internet banking JSC Eurasian Bank is as follows, select the tab, payment of services (оплата услуг), then the label «Payment for tickets (air, w/d, movie)» (Оплата билетов (авиа, ж/д, кино), the «transport card Recharge Onay» (Пополнение транспортной карты Онай). From October 1, 2016, for convenience of citizens, it becomes possible to purchase «Urban-Transport Pass» tariff for «Onay» transport card via «QIWI» terminal. It is now possible to use your card as Onay transport pass. Cardboard e-tickets are valid until December 31, 2016. «Urban-Transport Pass» tariff cost is 7200 (seven thousand and two hundred) tenge. It is valid for one calendar month, i.e. from the 1st day to the last day of the month, regardless of its actual purchase date. For current month, it is possible to purchase «Urban-Transport Pass» tariff from the 15th day of the previous month to the 14th day of the current month. To purchase and activate «Urban-Transport Pass» tariff, there should be minimum balance equal to one fare on the plastic card, that’s why you need to enter the sum of «Urban-Transport Pass» tariff and one fare. «Urban-Transport Pass» tariff users shall register each trip by putting of «Onay» card to the trip registration terminal at a vehicle. Green indicator and sound signal confirm the registration. 7)	to pay for the ticket, you need to enter the sum of «Urban-Transport Pass» tariff. For the purchase of «Urban-Transport Pass» tariff through online banking you must go to the tab «payment service provider» and then to find the item with payment by cards Onay, if you can not find the desired item by yourself, it is recommended to contact the contact center of your bank. For example, payment through internet banking JSC Eurasian Bank is as follows, select the tab, payment of services (оплата услуг), then the label «Payment for tickets (air, w/d, movie)» (Оплата билетов (авиа, ж/д, кино), the «Onay – Adult Pass» (Онай – Взрослый проездной). Finally, I urge everyone to use the transportation card and not pay drivers cash because electronic payments are bus depot’s transparency of income and inability to unjustified increase of tariffs for transportation, because there is no opportunity to fraud related to earned income. Also part of the payment in cash is deposited by drivers in their pockets, unfortunately tomorrow, this difference would have to be compensated by passengers.